Produzieren Sie das passende Werbegeschenk für ihre Zielgruppe. Bedrucken Sie diesen innovativen Werbeartikel inflatable mattress - beer bottle oder einen unserer Logo bedruckten aufblasbares in kundenspezifischer form Produkte. Mehr Werbegeschenk Ideen die für Ihr Promotion Projekt passen könnten sind: Werbemittel Inflatable Mattress, Logo Bedruckte Inflatable Chairs oder Merchandising Inflatables - Can Shaped. 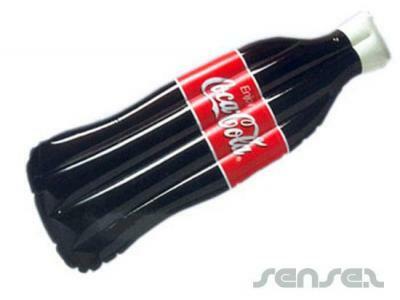 Your promotional inflatable mattress - beer bottle can be silk screen printed in 1 or more colours. Costs shown include a 1 colour logo print on your custom branded inflatable mattress - beer bottle. We can print more than 1 colour, however it incurs extra costs. We can achieve a perfect PMS colour match for the print. 4 colour process print is like a photographic print, where you can see a lot of detail and shading as part of your design. When we print your promotional inflatable mattress - beer bottle in full colour process we usually do this as a digital print. The colour match is quite good but is never quite such a perfect PMS colour match as is achieved by silkscreen print. This is the ultimate way of creating an engaging promotional product. Custom shape your inflatable mattress - beer bottle by completely designing the shape of it from scratch. You can search our products by different branding options to find which other items you can custom shape! Unsere Spezifisch fuer Sie Produzierten Inflatable Mattress - Beer Bottle koennen ab einer Mindestbestellmenge von 1000 Stücken hergestellt werden. Wir können Ihr Logo auf diese Werbe Inflatable Mattress - Beer Bottle anbringen. Eine Setup-Gebühr in Höhe von €176.00 faellt fuer die Film Kosten an. Die Lieferzeit beträgt 8 - 13 wochen vom Zeitpunkt der Bestellung.